Hayes finished with 17 points (5-9 FG, 7-8 FT), seven rebounds, six assists and two steals in Tuesday's 78-75 home playoff victory over Washington. Hayes had a superb all-around performance during the win Tuesday, accounting for 17 points on 55.6 percent shooting while grabbing seven rebounds and dishing out a team-leading six assists. This postseason, the former UConn standout is averaging 17.0 points and 5.5 rebounds over two playoff games. Hayes tallied 17 points (6-15 FG, 1-5 3Pt, 4-5 FT) and four rebounds during Sunday's 87-84 playoff loss versus Washington. Despite shooting just one-of-five at the three-point stripe, Hayes still managed 17 points due to her superb shooting inside the arc Sunday. The 29-year-old recently closed out the regular season averaging a career-best 17.2 points in 31 appearances this year. Hayes accumulated 21 points (7-17 FG, 1-4 3Pt, 6-10 FT), four rebounds, three steals and two assists across 26 minutes during Friday's 104-95 loss to the Mercury. Hayes' three steals matched a season high, though her two-way efforts couldn't propel the Dream to victory. Her 17.4 points per game rank 13th in the WNBA, and is a career high. Hayes and the Dream agreed to a multi-year contract extension on Tuesday. A second-round pick in 2012, Hayes is en route to average a career-high 17.7 points while shooting 47.0 percent from the field and 34.2 percent from beyond the arc. She's also chipping in 3.4 rebounds, 2.6 assists and 1.1 steals in her 28.3 minutes per contest. Hayes produced 19 points (8-12 FG, 3-5 3Pt), six rebounds, three assists and one block in the Dream's 89-74 victory over Chicago on Friday. Hayes' three-of-five mark from deep Friday lead the team in three-point shooting as she finished with 19 total points while also adding six rebounds in the win. Through 24 games played in 2018 so far, the one-time All-Star selection is averaging a career-high 17.3 points per outing. Hayes provided 18 points (7-16 FG, 1-5 3Pt, 3-5 FT), three rebounds, two assists and two steals in the 86-71 loss at home against the Mystics on Tuesday. Hayes' 16 total field-goal attempts Tuesday were the most she has tried in a game since June 14 but she only shot 42.9 percent from the field including a poor one-of-five mark at the three-point line to finishing with 18 points. Since dropping only five points on June 29, the 29-year-old has scored in double figures in every game since, a span of 11 consecutive outings. Hayes produced 16 points (7-14 FG, 1-2 3Pt, 1-2 FT), five assists and four rebounds in the 87-74 home victory over the Storm on Sunday. This was the ninth consecutive game in which Hayes has scored in double figures, as she managed to reach the 16-point mark Sunday on 50.0 percent shooting while also adding a team-leading five assists. Across 21 outings in her seventh WNBA season, the 29-year-old is averaging a career-high 17.4 points per contest. Hayes accounted for 13 points (3-9 FG, 0-3 3Pt, 7-7 FT), three rebounds and one steal during the Dream's 80-77 home victory over Washington on Sunday. Hayes picked up her poor shooting performance from the field by draining a perfect seven-of-seven at the free-throw line Sunday. Across 18 games played currently in 2018, the 29-year-old veteran is posting her best scoring season to date with 17.3 points per outing. Hayes recorded 23 points (7-14 FG, 3-6 3Pt, 6-6 FT), three rebounds, one assist, one steal and one block during Friday's 95-86 loss to the Storm. Hayes had a great offensive night during the loss Friday by knocking down seven-of-14 field-goal attempts while draining all six of her free-throws. With 17.4 points per outing, the 29-year-old is currently the Dream's leading scorer. Hayes finished with 19 points (7-9 FG, 5-5 FT), six rebounds, one assist and one steal in the 87-83 victory over the Fever on Sunday. Hayes had a terrific game off the bench Sunday, knocking down seven-of-nine field-goal attempts while draining all five free-throws. Over 13 contests so far in 2018, the seventh-year veteran is averaging a team-leading 17.0 points per game along with 3.5 rebounds and 2.3 assists. Career Transactions: Selected by the Atlanta Dream with the No.14 overall pick in the 2012 WNBA draft. 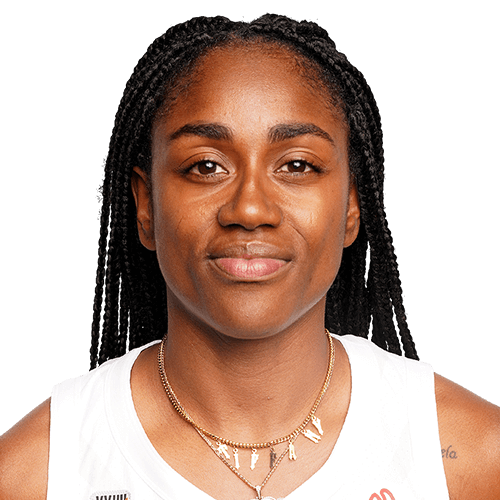 2017 WNBA Season: Led the Dream in scoring with a career-high 16.3 points per game, good for 13th in the WNBA…Played and started 33 games…Her 166 field goals, 48 three-point baskets and 158 free-throws made were all career-highs…Finished in double-figure scoring in 30 games during the season…Scored 25 points against Minnesota on July 28…Helped the Dream to a win over San Antonio with 25 points and seven rebounds on July 18…Earned first career start and appearance in the WNBA All-Star game…Named Eastern Conference Player of the Month (May). 2016 WNBA Season: Played and started 33 games for the Dream…Averaged 15 points and 3.4 rebounds a game… Scored 30 points and shot 10-of-17 from the field in Atlanta’s second round playoff loss to the Chicago Sky on Sept. 25…Scored a season-high 32 points vs. Sparks on June 30…Went an impressive 10-of-10 from the free-throw line resulting and finished with 27 points vs. Liberty on May 24. 2014 WNBA SEASON: Played in all 34 games, making 32 starts … Averaged 12.9 points, 3.0 rebounds and 2.5 assists per game … Ranked 22nd in the WNBA in scoring and fourth among guards in field goal percentage (.463) … Eighth in assist/turnover ratio (2.15) … 25 double-digit scoring games, including five with 20+ points … Led or shared team lead in scoring six times … Tied then-career high with 23 points, plus six boards and six assists, 7/29 vs. Connecticut … Career-high 27 points on 9-of-12 shooting 7/31 at Tulsa … Averaged 12.7 points on 48.1 percent shooting and 3.0 rebounds in three playoff games. 2013 WNBA SEASON: Played in 23 games, including four starts … Missed seven games due to surgery to repair a torn meniscus in her left knee July 9, and four more games after aggravating the injury … Team was 15-8 when she played, 2-9 when she didn’t … Averaged 11.3 points and 3.7 rebounds … Scored in double figures 12 times, including three games with more than 20 points … Led team in scoring four times … Played in all eight playoff games, including six starts, and averaged 12.4 points and 4.5 boards. 2012 WNBA SEASON: Played in all 34 games, including 17 starts … Named to the 2012 WNBA All-Rookie Team … Ranked fifth among all rookies in the WNBA in scoring at 8.6 points per game, second in assists (2.1) and 10th in rebounding (3.1) … Averaged 11.9 points in her 17 starts … Reached double figures in scoring 16 times … Ranked 24th in the WNBA in free throw percentage at 78.6 percent. … Averaged 4.3 points, 2.3 rebounds, 1.7 assists and 1.7 steals in Atlanta’s three playoff games against Indiana. COLLEGE CAREER: Two-time All-BIG EAST First Team selection … Helped Connecticut to two national championships and four Final Four appearances … Finished career with 147-7 record as a Husky … Tallied 23 20+ point performances, including three 30+ point performances as a senior … Averaged 14.7 points, 5.8 rebounds, 3.3 assists and 2.3 steals per game as senior … Most Outstanding Player ofr the 2012 Kingston Regional … Finalist for the Wooden Award and Wade Trophy … Associated Press Third Team Al-American. PERSONAL: Born Tiffany Kiara Hayes on Sept. 20, 1989, in Fort Polk, La. …. Parents are Dorothy and Renard Hayes … Majored in Sociology at Connecticut … Led Winter Haven High School to a combined record of 117-9 during four-year prep career … Also lettered in softball and cross country in high school.